The day before my triathlon I felt nervous because it was my 1st one! (Ed. note: It was actually her 2nd). On the day of my tri, I had to wake up at 5:15am! For breakfast, I had a bagel. The bagel made me quite energetic. I felt really proud that all my friends were there for me, and when we got there, I felt really scared and excited. Daddy took me to transition area where I learned how to set up my stuff. I felt super super terrified when I saw the pool—it was like an Olympic pool! Jess took me out of the pool. I was super happy that she took me out. The bike was really fun because I didn’t fall and I just got to enjoy the ride. On the bike course I saw my friend Sophia and my sister Nicole and her friend Molly. I also saw my mommy and daddy. At the beginning of the run my legs felt fine but then at the end they felt like they were going to blow up! The weather was really humid. My favorite part was probably the run because it was really fun for me and I’m good at it. If I could do anything different for my next tri it would be to work harder on my swimming. I saw a friend from school who also did the tri. At the end, I won a medal. My medal is really cool because it is my 2nd medal that is actually real from a triathlon. 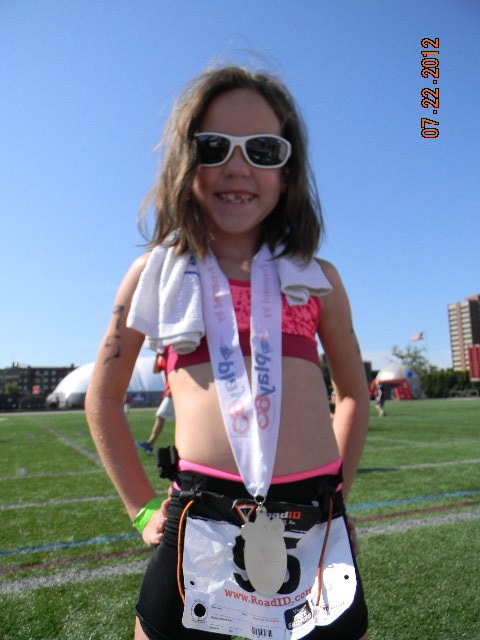 I found out that I came in 26th place and there were 46 kids in all doing the tri (Ed note: In her Age Group)! I came in 1st place for the run because I ran 1 mile in 8 minutes and 37 seconds. It was the fastest in all of the kids there!